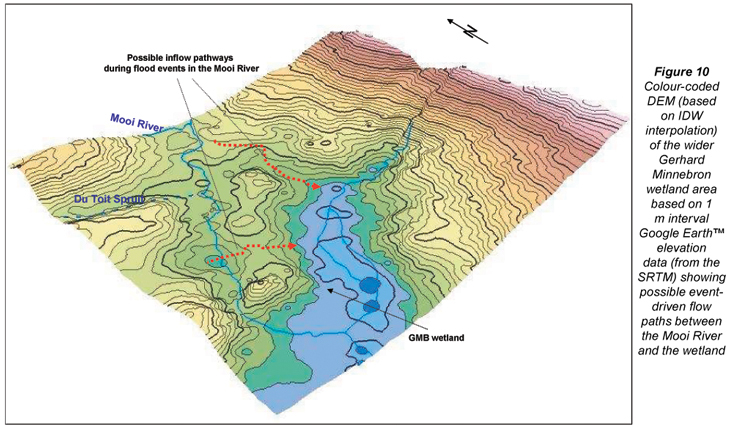 Digital elevation models (DEM) generated in geographical information systems (GIS) have proven to be useful tools in hydrological research, aiding, amongst others, the delineation of catchment areas, identification of drainage patterns and flow pathways as well as for runoff determinations. They are of particular value in areas of comparatively flat topography, where such tasks are often difficult to perform. However, owing to the fact that elevation differences in wetlands typically fall below or just into the range of contour intervals of standard topographic maps being generally 20 m, and 5m for some areas, the latter fail to give enough detail. This means that sufficiently detailed relief information is often difficult to obtain for wetland research. Site-specific, high-resolution relief surveys are too expensive, relative to many research budgets, to constitute a viable alternative. 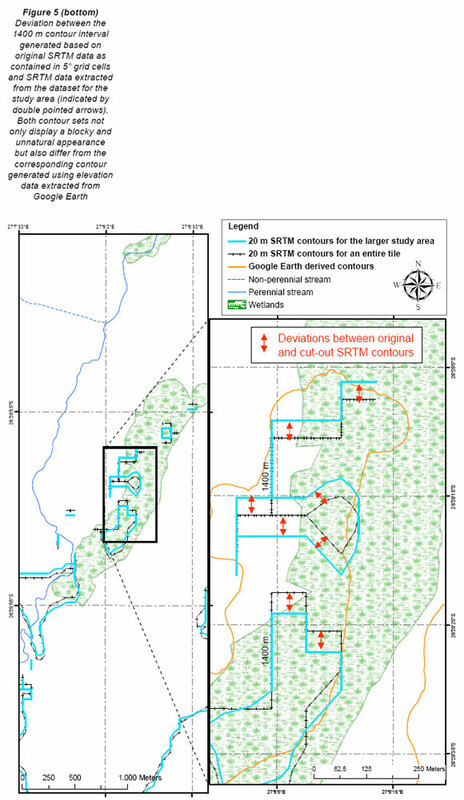 Based on an approximately 12 km2 study area surrounding a karst-related peatland, this paper presents a method to retrieve the required high-resolution elevation data at 1 m intervals, at low cost, from satellite imagery in Google EarthTM. 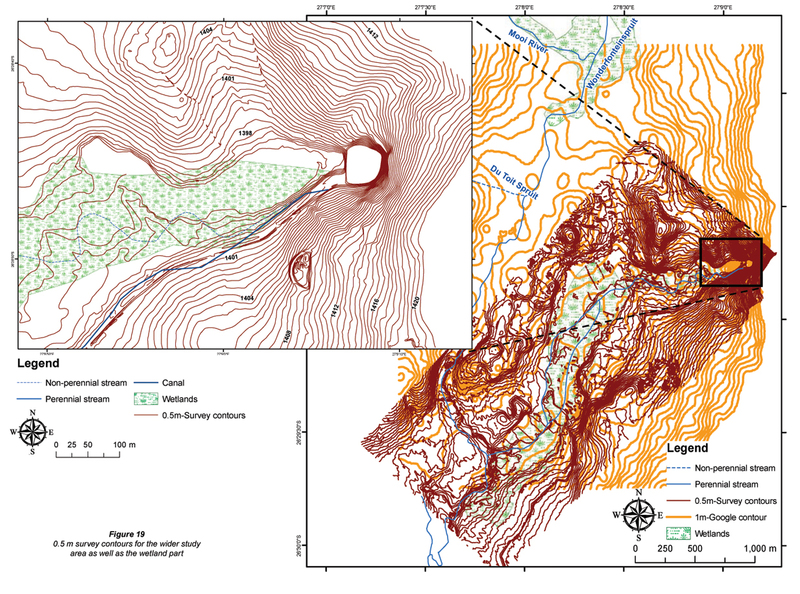 The paper describes procedures used to capture and process the data using GIS ArcDesktopTM to produce a high-resolution contour map and DEM. For quality assurance purposes the generated map is visually compared to 5 m and 20 m contour intervals of standard topographic maps (1:50000) issued by the Chief Directorate Surveys and Mapping (CDSM). After correcting an off-set of 5 m it was found that the deviation of the generated contour map based on Google data from CDSM contours was in the same order as the deviation between the 2 CDSM contour sets. Finally, all 3 contour maps were compared to a contour map of 0.5 m-interval resolution specifically generated for the study area using aerial photography from an airborne survey. This too confirmed the overall good reliability of the generated, Google EarthTM-based, contour map. Although Google EarthTM's contour models are based on data of the Shuttle Radar Topography Mission (SRTM), the direct use of freely available SRTM data for localised, high-resolution DEM yielded unsatisfactory results. This may be due to (unspecified) procedures, or unknown data sources employed by Google EarthTM that enhance the quality of relief data. With updating intervals of 2 to 4 years, satellite imagery in Google EarthTM offers the additional advantage of containing much more recent information on relevant hydrological features than the outdated topographic maps available for the study area. It is concluded that the presented method allows the generation of high-resolution DEMs especially for areas of flat topography where adequate relief information is either not available or too costly to generate. These DEMs are useful for further wetland research. Keywords: digital elevation model, DEM, Google Earth, GIS, wetland, hydrology, relief, contour intervals, Gerhard Minnebron peatland, SRTM, topographic maps. 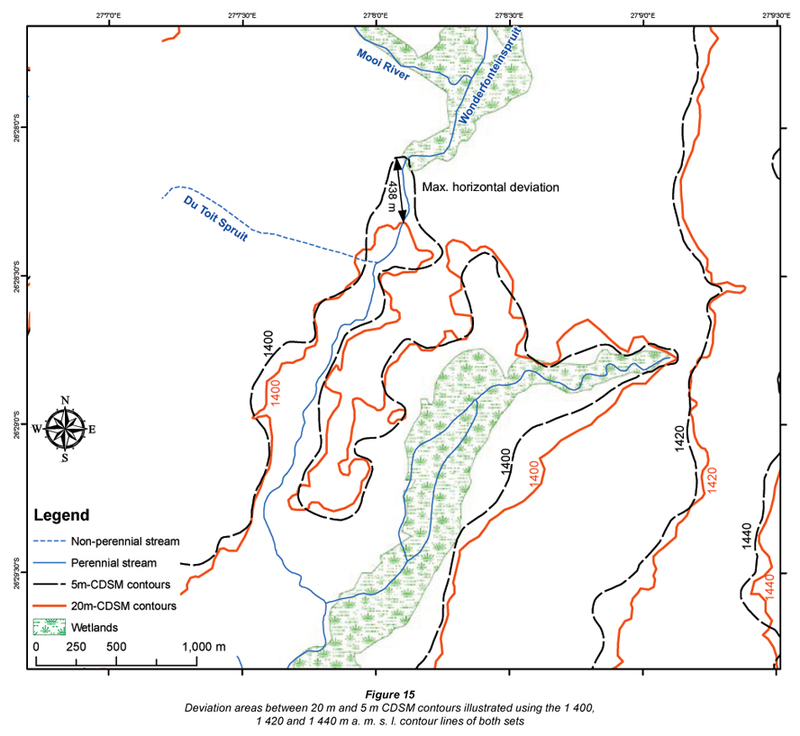 Owing to potential threats, associated with continued and poorly-regulated peat mining activities, to the ecological integrity of a peatland in the semi-arid karst region of the North-West Province (South Africa), the Department of Water Affairs and Forestry (DWAF) (now the Department of Water Affairs (DWA)), in conjunction with the Department of Agriculture (DoA) initiated a research project to assess impacts of peat extraction on the hydrological functioning of the Gerhard Minnebron (GMB) peatland (see Fig. 1). In the course of the study a GIS (geographic information system) was implemented to spatially represent data acquired for this wetland. This paper focuses on how high-resolution elevation data acquisition and integration into a GIS can be done cost-effectively by using virtual globe systems such as Google EarthTM to model areas with little change in relief. Hydrological modelling and GIS development were historically used in parallel but as separate avenues of specialisation. This continued until the late 1980s, when efforts to improve the analytical abilities of GIS began to blossom and researchers began to draw these 2 fields closer together (Raper and Kelk, 1991; Sui and Maggio, 1999). This fusion has resulted in the integration of hydrological techniques by GIS program suites (Sui and Maggio, 1999). ESRI's ArcDesktopTM suite is one such a program suite and was selected to set up a GIS for this study. Its 3D Analyst extension was of particular use and others, for example, ArcHydro, show considerable value regarding the visualisation and modelling of hydrological processes and features. In spite of the challenges faced regarding the use and integration of GIS in hydrological studies, there have been numerous examples of such endeavours, as is noted by Sui and Maggio (1999) and Raper and Kelk (1991). Wetland modelling-related integration examples can also be seen in studies regarding runoff processes (Drogue et al., 2002; Ko and Cheng, 2004; Soulsby et al., 2006), flood predictions (Al-Sabhan et al., 2003), water quality concerns (Janauer, 1996; Bobba et al., 2000; Janssen et al., 2005; Jewitt et al., 2004), and water balance questions (Alemaw and Chaoka, 2003; Fraser et al., 2001; Lacroix et al., 2002; Portoghese et al., 2005), to name but a few cases. A crucial component in modelling of hydrological processes such as surface runoff, catchment delineation and the determination of the nature of surface-ground water interactions is a DEM (digital elevation model) that can accurately capture the terrain in sufficient detail. DEMs also allow surface flow pathways to be identified without resorting to complicated automated hydrological modelling techniques. Relief reflected by standard topographic contours at a 20 m interval is acceptable for DEMs at regional scale, even for terrains with comparatively flat topography, such as the Highveld (see Fig. 2). However, such an interval is commonly insufficient to capture the required degree of detail in smaller areas, especially wetlands with their characteristically small changes in relief. The hydrology of the larger study area is controlled to a large extent by the presence of highly karstified dolomite which hosts some of SA's largest aquifers. 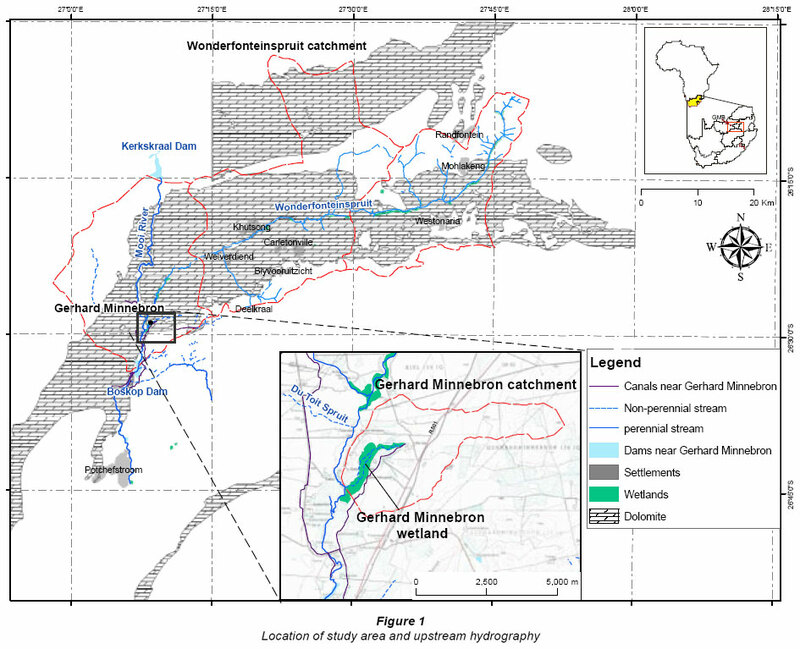 The Gerhard Minnebron wetland itself owes its existence to the continuous outflow of dolomitic groundwater from the Gerhard Minnebron karst spring, yielding some 60 to 80 Mℓ/d. 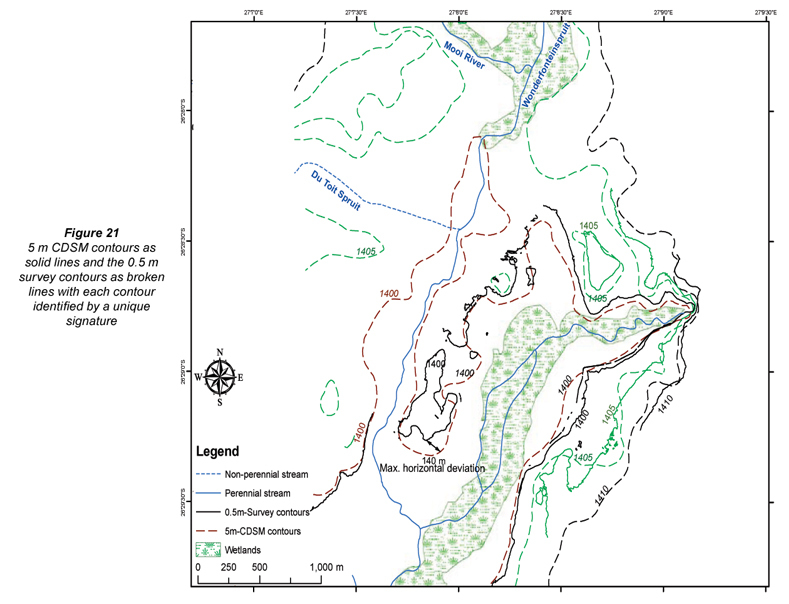 While falling outside the surface catchment of the Wonderfonteinspruit (WFS), which is the single largest tributary of the Mooi River, the Gerhard Minnebron Spring is possibly hydraulically linked to the WFS system via a network of underground karst channels present in what is known as the Boskop-Turffontein compartment (Winde, 2006). 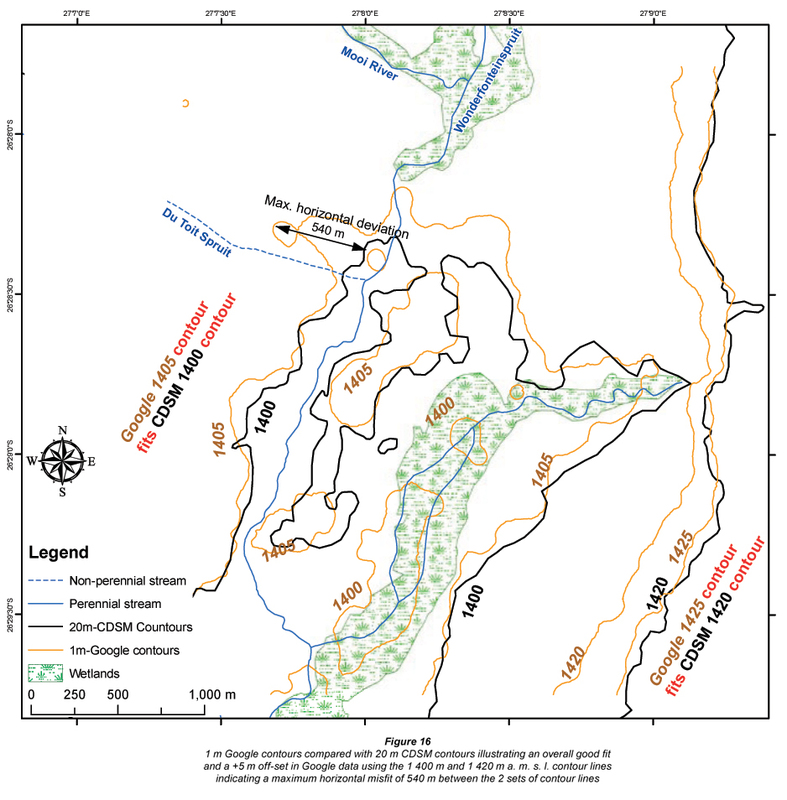 The location of the GMB wetland in relation to outcropping dolomite is shown in Fig. 1. At the Gerhard Minnebron wetland the maximum vertical difference between the highest and lowest elevation points does not exceed 15 m. This means that in standard topographic maps, such as the 1:50 000 series (which is the highest resolution map series covering the whole of South Africa) displaying 20 m contour intervals, this vertical difference in topography will be lost. For areas covered by (aerial) orthophotographs at 1:10 000 scale the Chief Directorate: Surveys and Mapping (CDSM) is able to provide derived contour information at 5 m intervals in digital format. While this greatly improves the vertical resolution of DEMs at sub-regional scale it is still insufficient for adequately capturing hydrologically-relevant topographic detail in wetlands, where relief changes well below 5 m are often crucial for determining flow patterns. In South Africa professional consulting firms specialising in aerial surveys are often the only alternative source for generating sufficiently detailed relief data. Depending on the location of the site (distance from airport) this option is commonly too costly for many research budgets. 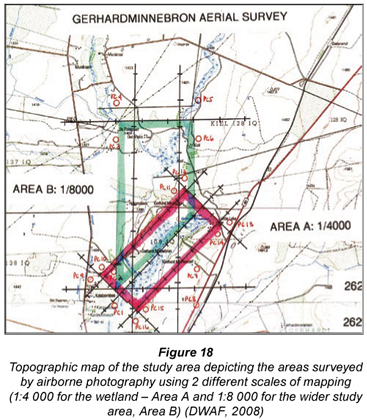 In the particular case of the 10.8 km2 study area at GMB, costs for the aerial survey at 0.5 m contour resolution amounted to ZAR100 000 (Minnaar, 2009) equating to ZAR9 259/km2. For 'metropolitan and growth areas the CDSM provides higher resolution DEMs (not contour maps) based on 50 m x 50 m (0.25 ha) grid cells at the cost of shipping only. For selected areas in more remote regions DEMs of somewhat lower resolution (200 m x 200 m  4 ha and 400 m x 400 m grid size 16 ha) are available (CDSM, 2007). However, for the vast majority of areas such information is not available, as was the case with the study area. This paper presents a cost-efficient alternative for creating the required level of vertical resolution by using satellite imagery provided, at a relatively low cost via the internet, by Google's Google EarthTM application. The core of the method is based on elevation readings given by Google EarthTM for any position of a cursor which is moved across a chosen satellite image. Depending on user preference this elevation is provided in feet or meters above mean sea level (m a. m. s. l.) at intervals of 1 ft (approximately 30.5 cm) or 1 m, respectively, and displayed in a control bar at the bottom of the image. Together with the elevation, the exact coordinates for the locations indicated by the cursor position are provided (Fig. 3). In the specific case of this study it means that Google Earth Google EarthTM's elevation data are at a resolution 5 to 20 times higher than available datasets provided by the CDSM. In Google Earth Google EarthTM this dataset supports an additional function which allows users to view the relief in their area of interest in 3-D fashion with a maximum vertical exaggeration factor of 3. For some areas in the GMB wetland this exaggeration was insufficient to visualise height differences important for determining pathways of surface flow during flood events, for example. However, once these data have been imported into a GIS the exaggeration factor can be chosen at will. In order to use this detailed relief information provided by Google EarthTM in a DEM a method had to be designed to import Google elevation data into a usable GIS format for use in ArcDesktopTM. This method is presented in this paper, accompanied by a critical evaluation of the quality and reliability of the resulting GIS-based DEM. Google EarthTM provides high-resolution elevation data using the virtual globe system, which started in June 2005 and used Shuttle Radar Topography Mission (SRTM) data for its elevation baseline. The SRTM was an initiative, by the National Aeronautics and Space Administration of the USA (NASA), the USA's National Geospatial-Intelligence Agency, the German Space Agency and the Italian Space Agency, to produce a standardised, complete and high-resolution DEM of planet Earth using Interferometric Synthetic Aperture Radar (InSAR) technology (Farr et al., 2007). Taking 10 d or 149 orbits the mission covered an area between 60° N latitude and 56° S latitude leaving the largely uninhabited polar regions out. Each orbit produced a strip of images in 225 km wide swaths (Farr et al., 2007). Almost the entire targeted area (99.96%) was mapped at least once, with only a few patches over North America having been missed. Data errors of this mission are similar to those of the USA's National Elevation Dataset (Farr et al., 2007). With InSAR cells generated at 1 arc-second by 1-arc-second (~ 30 m x 30 m) the vertical height error for absolute error (i.e. measured against ground truth) is less than 16 m and the relative (i.e. measured against generated data) linear vertical height error is less than 10 m (Farr et al., 2007). Regarding the circular and horizontal geo-location, SRTM data have an absolute error of less than 20 m and a relative error of less than 15 m. It should also be noted that this method is not able to penetrate the vegetation canopy and thus, in densely-vegetated areas, overestimates ground elevation by the height of trees (Farr et al., 2007). Since the semi-arid Highveld, into which the study area falls, is only sparsely vegetated with bushes and scrubs this error is of marginal, if any, importance. Since SRTM data underlie the Google EarthTM DEM, attempts were made to use these data directly for generating a high-resolution relief model of the wetland. However, the contours derived directly from SRTM data (as downloaded free of charge from the website of the Consortium for Spatial Information  an initiative from the Consultative Group for International Agriculture: http://srtm.csi.cgiar.org/), by subjugating them to high resolution interpolation, yielded unsatisfactory results with many contours showing an unnatural, blocky appearance and frequently being open-ended (Fig. 4, next page). A possible reason for the fact that contours based on the original SRTM data are less satisfactory than those generated via Google EarthTM may be related to the continuous refinement of elevation data in Google EarthTM through successive addition of high resolution data from other sources as they become available for different areas (Taylor, 2009). This is implemented by not only utilising satellites but also other (unspecified) technologies (Aubin, 2009). Another reason may relate to the fact that SRTM-data had to be cut out from a larger set covering a 5° latitude by 5° longitude grid cell since the computational power required to generate 1 m contours for the entire grid cell exceeded the capacities of available computers. However, extracting the data relevant for the study area results in some deviation from the main dataset owing to interpolation-related errors associated with the newly defined margins of the cut-out area. This resulting misfit between original data from the entire grid cell and cut-out data for the study area is illustrated in Fig. 5 using 20 m intervals as an example (instead of 1 m intervals to reduce the computational requirements). In view of the above-described difficulties the extraction of improved elevation data as used in the final Google EarthTM product was attempted. In addition to improved accuracy compared to SRTM data this had the additional advantage of the relief information being geographically linked to continuously-updated land use data. 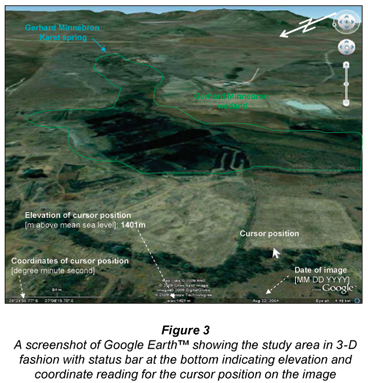 Since the inception of the peat project in late 2005 the imagery covering the wetland was updated 3 times, which is in line with the average update interval indicated by Google EarthTM (Fig. 6, next page). Compared to available topographic information on the area, which dates back to 1975 (1:10 000 black and white orthophotographs) and 1995 respectively (1:50 000 map series, sheet Rysmierbult 2627 AC), Google EarthTM imagery is significantly more recent. This is of particular importance with regard to possible quantification of impacts associated with peat mining, which results in a visible reduction of wetland areas and increasing extension of open water surface. With most of the peat mining activities commencing on a large scale after 2003, these impacts on the area's hydrography are not captured in any of the standard topographic sources. However, owing to a rather low resolution of the first set of Google imagery for the study area, many of the required details were still obscured. Resolution improved significantly with the 1st update covering the whole area of interest by images dated August - September 2004 (Fig. 6). At this resolution, details such as the size and shape of the several ponds created by peat mining within the wetland, the course of the drainage line, and the flow status of nearby streams and dams were discernable. The situation improved further with the 2nd update of imagery, after which the majority of the study area was now covered by satellite imagery as recent as June 2007 (Fig. 6, next page).  In the 1st step, a procedure was developed to capture Google EarthTM elevation point data and subsequently import them into the GIS ArcDesktopTM.  The 2nd step comprised of the generation of a high-resolution contour map and DEM in GIS ArcDesktopTM using the imported elevation data from Google EarthTM.  In the final step, the quality and reliability of the generated contour map underlying the DEM were assessed by comparison with standard CDSM contour data as well as high-resolution relief data generated from airborne survey data. With an elevation interval of 0.5 m the latter provides the highest resolution of all datasets and was therefore used as a benchmark. 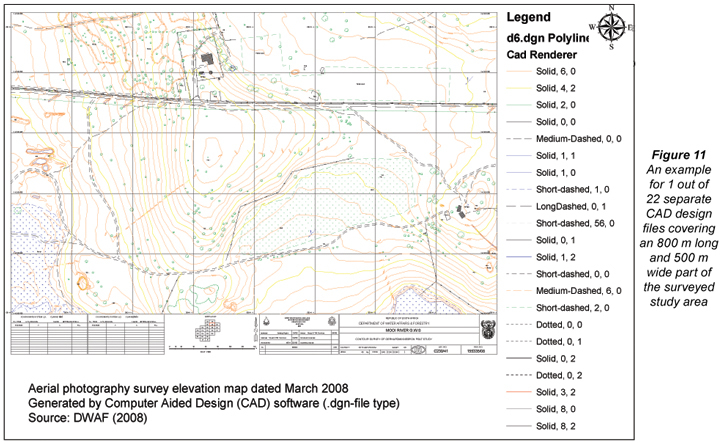 However, having been generated by Computer Aided Design (CAD) software, the data first had to be converted into a GIS-compatible format. A schematic overview of the process of generating a high- resolution DEM, in the form of a flow diagram, is depicted in Fig. 7. As a 1st step the extent of the target area had to be determined, taking possible hydraulic links between the wetland and the adjacent stream systems, especially overland flow during high flow conditions, into account. 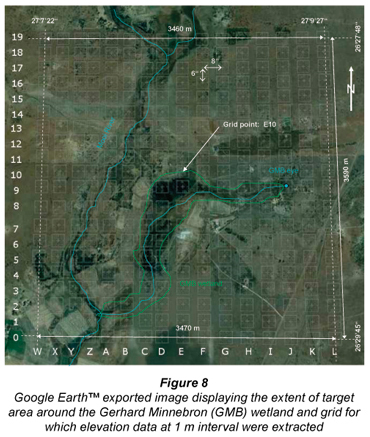 This resulted in a target area exceeding the actual size of the Gerhard Minnebron wetland (Fig. 8). Using the 'display grid option' of Google EarthTM this target area was overlain by a grid of markers, with 6" longitudinal and 8" latitudinal difference between points resulting in a total of 16 columns and 20 rows (Fig. 8). The columns were named with capital letters in alphabetical order from west to east, starting at the column intersecting the confluence between the Gerhard Minnebron stream and the Mooi River. Later 4 columns were added to the west named W to Z. Together with the rows numbered 0 to 19 from south to north each point of the grid received thus a unique alpha-numerical ID-code (Fig. 8). Each grid point was marked by a so-called 'placemarker', a Google EarthTM function in which additional information can be recorded and displayed on screen. Using this 'placemarker' function for each grid point, the elevation was displayed when the cursor was held over the point in question and manually recorded. In addition to the elevation of the grid points, every point at which elevation changed (by 1 m) was logged and captured together with its coordinates in a Microsoft ExcelTM spreadsheet. Changes in elevation between grid points were established by slowly moving the cursor along the longitudinal and the latitudinal grid lines until the elevation reading changed. This was frequently done through zooming in to obtain a more accurate spatial reference of the point in question. All elevation points were placed between 2 adjacent grid points (horizontally, east-west, or vertically, north-south) and named by combining the code of the 2 points separated by an arrow indicating the direction of cursor movement. Requiring an estimated 30 h, a total of 2080 elevation points were captured covering an area of some 12.44 km2 (equalling some 2.5 man-hours per km2 at a rate of some 70 points/h). At an hourly rate of ZAR300 this would result in ZAR700/km2. After inclusion of proportional costs for the internet connection and the licence fees for the GIS software, this is over 10 times more cost-efficient, for this area, than the high-resolution, airborne survey. Points where the elevation changed by 1 m in a W-E direction are grouped as 'horizontals' while points changing in a N-S direction are termed 'verticals' (Table 1). DeciDegEast and DeciDegSouth are the decimal degree coordinates for the latitudes and longitudes, respectively. Newer versions of Google EarthTM tools/options show how latitude/longitude can be changed, sparing the user from manually calculating these coordinates. It should be noted that the resolution could be increased by a factor of 3, to 0.3 m contour intervals, by choosing in Google EarthTM to display elevation in feet instead of meters. Since this would have resulted in approximately triple the amount of time spent on capturing the elevation points, only changes at 1 m intervals were used in this pilot study. Out of the 2 080 points logged, only points where the elevation displayed in Google EarthTM changed, e.g. from 1 410 m to 1 409 m (in total 1 760 points, termed 'horizontals' or 'verticals') were used to generate the contour map, resulting in a density of 1 elevation point per 7 069 m2. The remainder are grid points that were omitted since their elevation could not be determined as accurately, as most of them fall somewhere in between points where elevation changes. The use of the 320 grid points would therefore have introduced an error margin of up to 1 m per point. Using the Inverse Distance Weight (IDW) technique of ArcDesktopTM to interpolate between these points a 1 m interval contour map of the study area was generated (Fig. 9). Based on the retrieved set of elevation data from Google EarthTM a DEM was generated in ArcDesktopTM allowing for a 3-D-view of the study area. Enhancing elevation data through colour-coding aided the identification of potential pathways for water from the Mooi River possibly entering the peatland during flood events as well as additional outflow (seep) points (Fig. 10, next page). 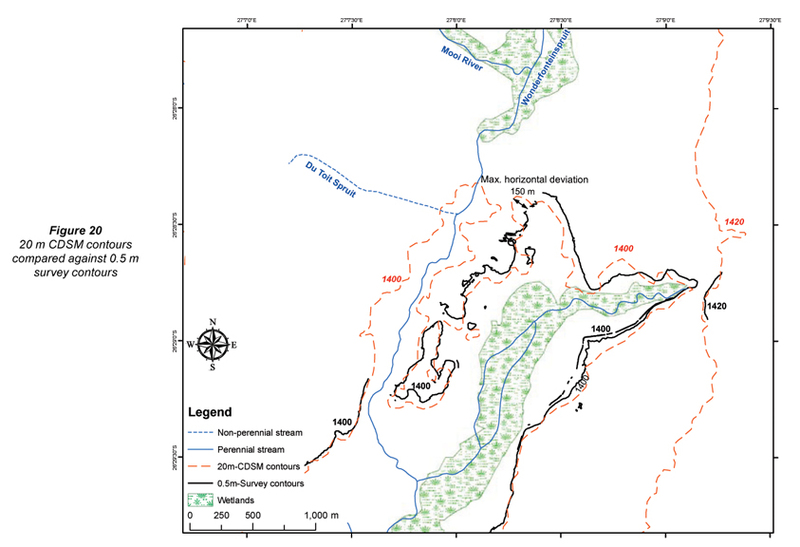 In order to assess the reliability of the generated contour map and the associated DEM of the study area, the contour information was compared against 2 sets of standard topographic data (20 m and 5 m contour intervals from CDSM). The latter 2 sets were also compared to each other to assess how much same-source contour data may deviate from each other. This, in turn, provides some baseline as to what degree of deviance is regarded as acceptable by the CDSM, and was thus used to assess the quality of the generated 1 m Google contour data. In addition, elevation data from an aerial photography survey later became available to the project. This dataset provided the study with, among other features, 0.5 m contoured elevation data (acquired digitally from DWAF, 2008). Having the highest resolution this dataset was used as a benchmark against which all other contour datasets were compared. Generated in a computer-aided design (CAD) program, digital elevation data underlying this map had to be converted to be used in the ArcView GIS. This procedure, as well as pertinent technical details of the airborne survey, is briefly outlined below. Apart from the visual comparison employed in this paper there are other, more formalised and quanti- fiable, procedures such as those used by Gorokhovich and Voustianiouk (2006) and Sun et al. (2003). However, in view of the associated debate regarding the best method, and the fact that visual comparison proved to be sufficient for the purpose intended, no further efforts were made to quantify deviations between the different contour sets in a formalised manner. The mapping is based on a stereoscopic evaluation of a series of aerial photographs taken from an aircraft at a height of 4 000 m above ground level, accurate enough for use in 1:2 000-scale plans (Smith, 2009). Twelve ground-control points of known elevation and coordinates were employed to geo-reference the images acquired from the aircraft. Geo-referenced stereoscope images were produced and, by using these images and a stereo-plotter, contours and other features were drawn in (Smith, 2009). The data from the airborne survey were then digitised using a CAD program locking all feature information in a single CAD file (design files, .dgn). Within these files colour and cartographic symbols are used to identify different features. An example of such a file for a segment of the study area is displayed in Fig. 11. The conversion of CAD data into GIS-compatible shape files was complicated by the fact that for symbols consisting of more than 1 part (such as a dashed line which is made up of many small lines), each separate part of that symbol is identified in GIS as a topographic feature. While these single parts are still automatically grouped into one larger shape file (e.g. a catchment boundary), such shape files cannot be used for determining enclosed areas. This is only possible once each part of the shape file is connected to others forming one larger entity (using among other techniques the 'merge function' in the 'Editor' tool of ArcDesktopTM). Where CAD lines were enclosing areas such as mining ponds, wetlands, etc., of which the area size had to be determined, this connection of separate symbol parts had to be performed, rendering the import of CAD data rather time-consuming. Before the area enclosed by such lines could be determined, all these lines had to be linked together to form an uninterrupted line around the area which could then be transformed into a polygon using the 'buffer' and 'union' functions in ArcDesktopTM. Only after the polygons are created, can the size of enclosed areas be determined. Examples for such areas (wetlands and mining ponds) are displayed in Fig. 12. Compared to the 1:50 000 topographic map, spatial deviation between the GIS-imported CAD data and mapped topographic features was detected; these misfits are possibly related to inaccuracies in geo-referencing and projection. However, for the purpose of the project, the misfits were regarded as tolerable. The DEM produced from the CAD dataset differs from the Google-based DEM in that it was based on CAD-generated contours and not on interpolated elevation points. 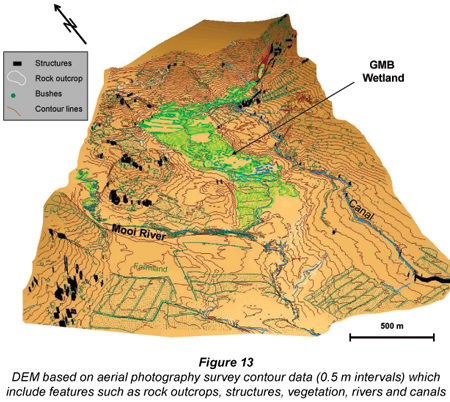 Figure 13 shows the CAD-based DEM of the GMB wetland also displaying some of the features captured by the aerial survey. Before comparing 20 m interval CDSM contour data with the 5 m CDSM contours it was noted that the contour data in vector format (i.e. discrete .shp files) showed some deviation from identical contours as displayed in scanned images of 1:50 000 topographic maps imported into ArcDesktopTM. The topographic image's contour lines (as the original data source) were subsequently taken as the base dataset to adjust the digital (vector) contour lines (Fig. 14). The adjusted set of the digital 20 m interval contour data was subsequently used for the following comparisons. Owing to the generally flat topography of the wetland only 3 x 20 m interval contours occur within the larger study area and can thus be compared to the 5 m interval contours. 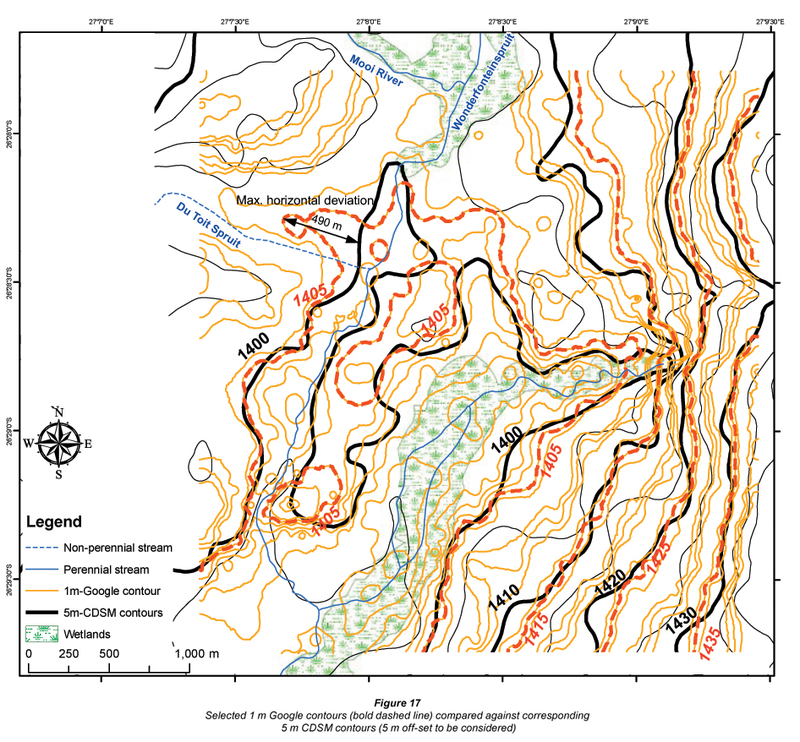 Figure 15 depicts the deviations between 2 sets of contour lines both originating from the CDSM. In assessing the deviation between contour lines, it is important to note that identical degrees of deviation in steep terrain result in generally smaller horizontal distances between contour lines (i.e. 'misfits') than in flat terrain where the lower topographic gradient (the height difference kept constant) results in a larger horizontal distance between contour lines. With some 438 m the largest horizontal misfit occurs at the 1400 m contour in the (flat) confluence area where the Du Toit Spruit joins the Mooi River (Fig. 15). To compare the 1 m contour map ('Google contours'), only the 2 x 20 m CDSM contour lines ('CDSM contours') which occur in the area of interest could be used, namely the 1 400 m and the 1 420 m a. m. s. l. lines. Comparing these with the corresponding contour lines, from the generated Google map, suggest an overall satisfactory fit between the 2 sets of contours (Fig. 16). However, Google contour lines matched best with CDSM contours which generally displayed a 5 m lower elevation (Fig. 16). The reason for this 5 m off-set could not be determined. It is, however, relatively easy to adjust by subtracting 5 m from all contour heights in the generated Google map. As was the case with the 5 m vs. 20 m CDSM contour data, the largest horizontal deviation (540 m) occurs at the 1 400 m contour at the confluence area of WFS and Mooi River, this time, however, extending into the Du Toit Spruit area (Fig. 15). Based on the maximum horizontal deviation it appears that the generated 1 m-Google map fits well to the 20 m CDMS contours (with a maximum horizontal deviation of 540 m) while the 5-m-contour set fits to the 20 m CDMS contours (also created by the CDSM) with a maximum horizontal deviation of 438 m. The fact that the generated map based on Google data displays an even better fit to the standard 20 m CDSM contour than the 5 m contour generated by the CDSM themselves indicates a better-than-expected reliability of the generated Google map. Comparing 1 m Google contours with 5-m-CDSM contours once again showed an overall good fit between the 2 datasets (Fig. 17). 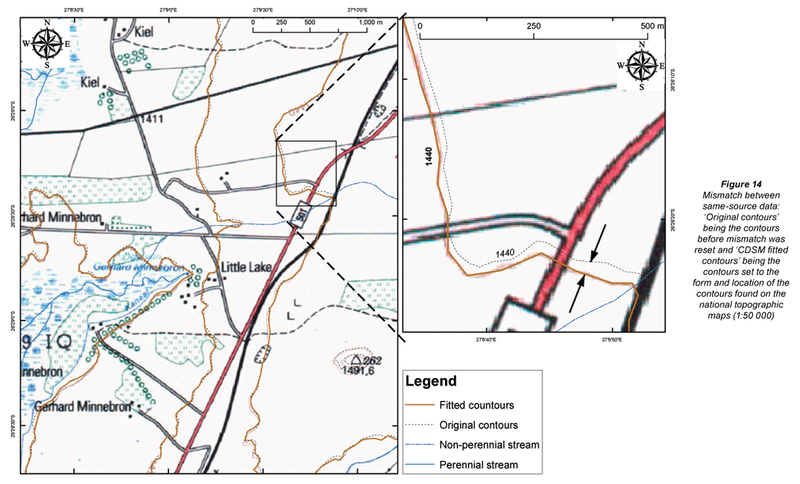 As observed in the 2 previous comparisons the largest horizontal deviation occurs again on the 1 400 m contour line next to the confluence of the Mooi River and the Du Toit Spruit (490 m) (Fig. 17). As demonstrated earlier, this is most likely not due to an above average error in either of the datasets but rather due to the fact that this area is particularly flat resulting in larger horizontal misfits than identical misfits in steeper terrain. The survey was done at 2 different levels of accuracy with the GMB wetland itself mapped at a scale of 1: 4 000 while the wider study area extending to the confluence of the WFS and the Mooi River was captured at a scale of 1:8 000. However, the contour interval resolution for both areas was kept at 0.5 m. The location of the 2 areas mapped using airborne survey data is indicated in Fig. 18. For the purpose of comparing contour lines only the area mapped at higher accuracy (1: 4 000) covering the actual wetland is used. The 0.5 m contour interval map produced for the study area is displayed in Fig. 19. The noticeable lack of contour lines in the actual wetland illustrates the flatness of the area, where differences in the micro-relief driving the development of flow patterns are frequently well below the 0.5 m interval. It should also be noted that the confluence area of the Du Toit Spruit and the Mooi River falls outside the 0.5 m part of the survey (Fig. 19). For the subsequent comparison with contour data of alternative origin, only those contour lines of the 0.5 m set which correspond with the contours of the different datasets falling into the surveyed area are displayed. 20 m CDSM contours: Measured against 2 contours from the 20 m CDSM contour dataset (1 420 m and 1 440 m a. m. s. l.) the aerial photography survey contours require no off-set correction displaying an overall good degree of congruence between the 2 contour sets (Fig. 20). Owing to the limited area for which the survey at this resolution was done, only parts of the 20 m contours can be compared against corresponding 0.5 m survey contours. For the area covered, a comparatively small horizontal deviation of a maximum 150 m at the 1 400 m contour line indicates an overall good fit between the 2 datasets (Fig. 20, next page). 5 m CDSM contours: As Fig. 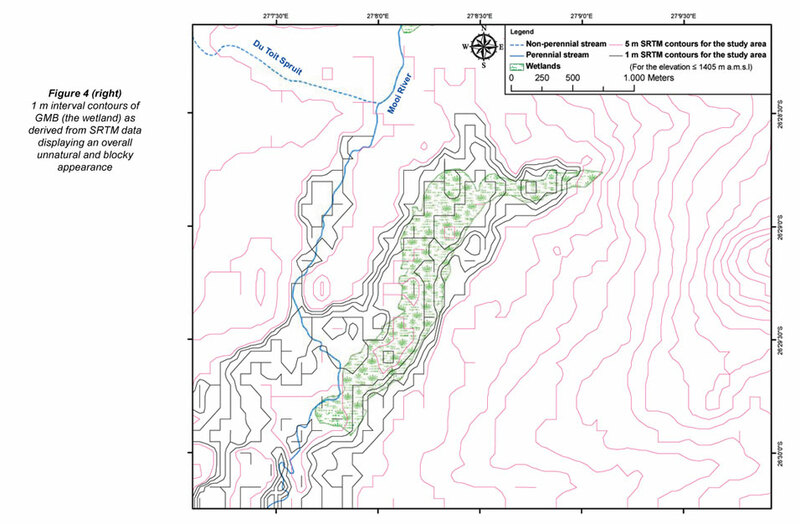 21 (next page) indicates, the 0.5 m survey contours and the 3 relevant 5 m CDSM contours (i.e. 1 400 m, 1 405 m, 1 410 m) match well. Unlike deviations in previous comparisons, the maximum deviation was not found to be associated with the lowest-lying contour line in the study area (1 400 m a. m. s. l.) but occurred at the 1 405 m contour where it amounts to some 140 m (Fig. 21). 1 m Google contours: Before comparing the 2 datasets the Google contours had to be corrected by reducing the displayed elevation for each contour line by 5 m. Owing to the relatively large number of contours only the following 5 pairs of corresponding contour lines are compared with each other: 1 400 m, 1 405 m, 1 410 m, 1 415 m and 1 420 m a. m. s. l. (Fig. 22). The deviation between the 0.5 m survey and 1 m Google contours appears to be more complicated than a simple misfit, with a maximum horizontal deviation of 221 m (Fig. 22). In addition there is also a sporadic difference between the shape of 1 m and 0.5 m contour lines covering the study area. 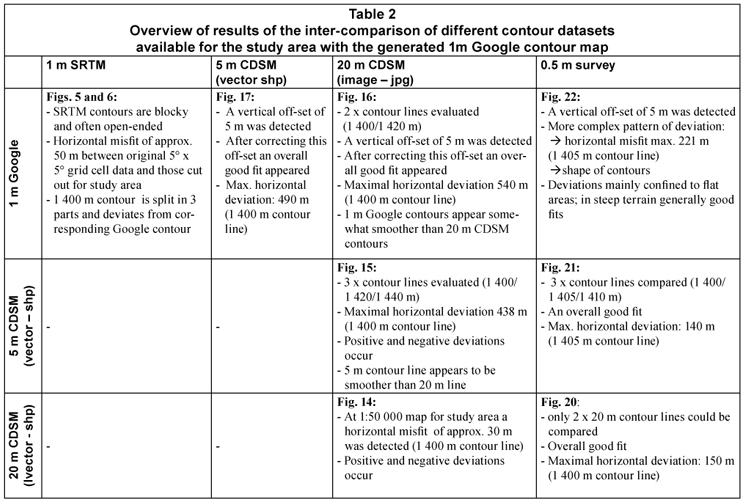 The results of the various inter-comparisons of different contour sets discussed above are summarised in Table 2. A common problem for hydrological research in topographically flat areas such as wetlands is the lack of sufficiently detailed elevation data required to reliably delineate catchment areas, understand flow patterns within the wetland and to identify potential hydraulic interactions between wetland and adjacent streams, to name but a few examples. GIS-based DEMs prove to be useful tools in addressing most questions. Compared to standard topographic maps displaying 20 m contour intervals, and 5 m intervals for selected areas, elevation data provided by Google EarthTM, an internet-based global visualisation application, are provided at a high enough resolution to create 1 m intervals, at a minimal cost. Although SRTM data underlie the Google EarthTM relief information, the direct use of freely-available SRTM data downloaded from the internet yielded unsatisfactory results that were found to be inferior to contours generated by the procedure described in this paper. Apart from errors associated with the interpolation of elevation data cut-out from larger sets, this may be caused by the continuous improvement of the terrain database in Google EarthTM which in addition to satellites also includes other technologies and alternative data sources. This may partly explain why the vertical accuracy of Google elevation data is higher than the 16 m indicated for the original SRTM data. 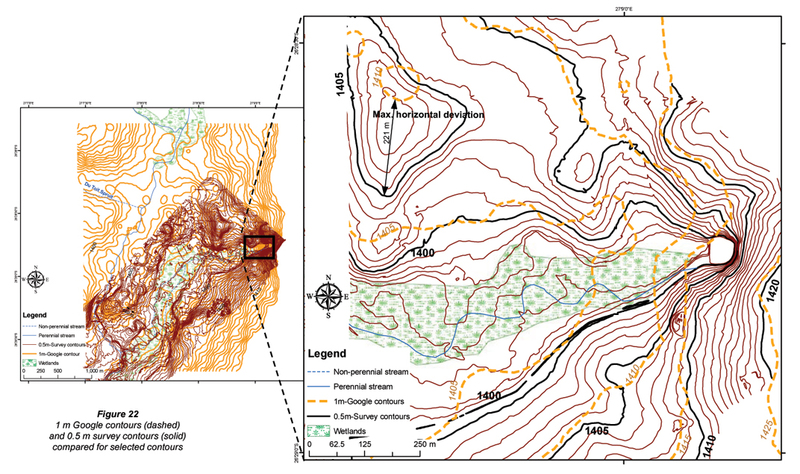 Even after introducing potential errors associated with the extraction of elevation data described in this paper, the generated contours and DEMs at 1 m contour resolution were found to compare favourably with not only relief data of standard topographic maps but also results of a high resolution aerial survey. However, with little or no information available on the exact procedures and interpolation techniques used in Google EarthTM that so obviously improve the original SRTM dataset, such good agreement may be area-specific and can therefore not be unconditionally extrapolated to other regions. In addition to higher resolution relief data, Google EarthTM also provides more up-to-date hydrographical information, as a result of the close updating intervals  2 to 4 yr compared to the approximately 20 yr intervals for the 1:50 000 topographic maps. This is of particular importance in environments where anthropogenic impacts such as peat mining result in fast-changing hydrographical conditions. The method developed to capture elevation data from Google EarthTM and import these into ArcDesktop GIS proved to be successful in creating a reliable, high-resolution DEM for the study area. After the off-set corrections of 5 m, deviations of the generated 1 m contour lines from 20 m contours contained in the 1:50 000 topographical map of the CDSM, the deviations were found to be less than those between the 2 CDSM contour datasets (i.e. 20 m and 5 m interval contours). As sources for potential errors it should be noted that, apart from some deviations between the 20 m and 5 m CDSM contour lines, we also detected discrepancies between printed contours in scanned images and contours in digital format (vector data), both provided by the CDSM. Compared to contour lines at 0.5 m intervals from a photogrammetric airborne survey, more complex patterns of deviation to the generated 1 m Google contours were found, while the (significantly less dense) CDSM contour data continued to show an overall satisfactory degree of congruence. However, with approximately ZAR10 000 per km2 for the airborne survey the presented method of sourcing elevation data from Google EarthTM is over 10 times more cost-efficient, provided that internet access, appropriate GIS software and entry-level GIS operating skills are available. The generated 1m resolution DEM was found to significantly enhance the visual understanding of the micro-relief in the studied wetland which despite numerous field visits remained invisible to the naked eye. This, in turn, aids the understanding of how landforms may influence hydrological processes such as direction of water flow, development of drainage patterns, occurrence of groundwater discharge areas, etc. 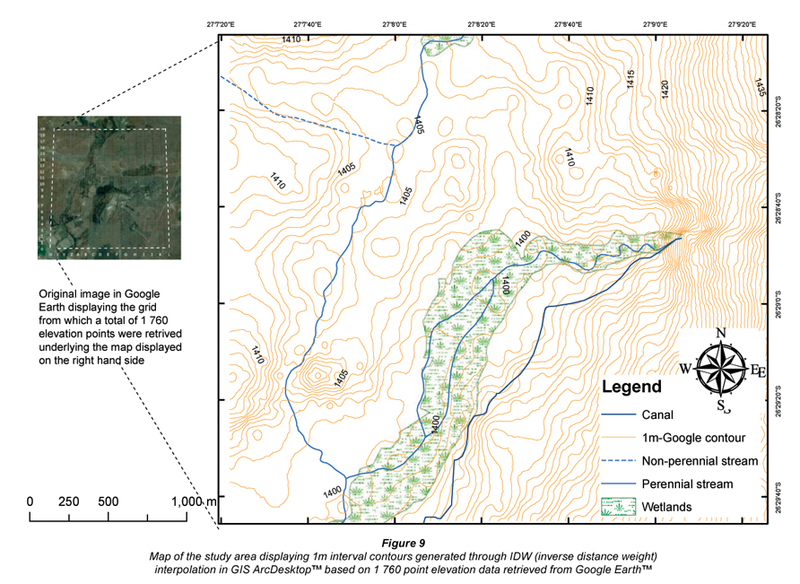 Applying the computer-generated DEM to the study area also aided the delineation of catchment boundaries and identification of presently unmapped surface depressions along which flood waters enter the wetland. Moreover, maximum peat accumulation levels could also be determined as they are controlled by the elevation of the water table at the outflow point. In summary it is concluded that the presented methodology allows the retrieval, conversion and application of elevation data from Google EarthTM in order to produce reliable GIS-based DEMs that have significantly higher resolutions than the standard topographic maps. 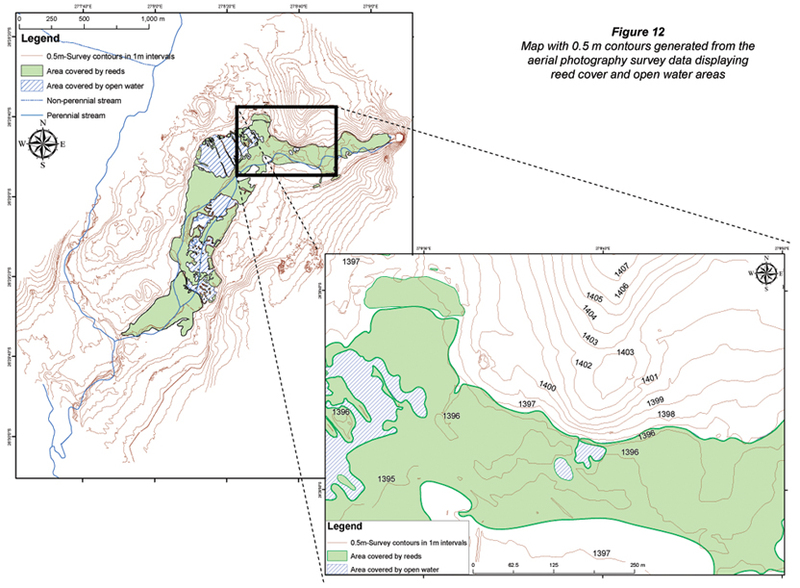 These DEMs and contour maps have proven to be particularly useful tools for hydrological research in low-relief energy environments such as wetlands for which adequate contour data are either not available, or too costly to generate. Funding of the project (Project No. 2006-231) and logistical support by DWAF (now DWA) is gratefully acknowledged. The researchers would also like to give heartfelt thanks to Ms S Rudolph and the DWA agents at the Boskop Dam and Aquapark offices for their patience, help, data and other saving graces, as well as to T de Klerk and D Cilliers for their input. We also wish to thank an anonymous reviewer, in particular, for her/his encouraging and constructive comments. Received 20 April 2009; accepted in revised form 12 November 2009.